Warning: You know I tend to be wordy, but this one goes on and on and on. You might want to get another cup of coffee or some wine (depending on where you are in your day) before settling in to read this. Just sayin'. I've been intrigued by eventing since I was a little girl. I think when I was around 11 or 12 my parents brought me to see the Essex Horse Trials at the USET headquarters in Gladstone. I can still remember seeing Bruce Davidson and being completely starstruck. I can also remember having mononucleosis the summer of 1984 and being glad of it because it meant I could watch TV all day and that meant I saw almost all of the limited equestrian coverage. I remember watching the eventing and thinking, "Dang, that looks really cool, " at the same time I thought, "Dang, that looks scary as heck." I started riding in the hunter and equitation divisions as a kid, and then when I became a re-rider several years ago, that's what I went back to. I got involved in the jumper divisions because Sugar was a jumper when I got her. She was the right horse for me, so I just decided to do what she was good at. That being said, I've always believed in taking the horses out of the ring. I love galloping or schooling in fields, and exploring trails. I think it's good for the horses, both mentally and physically, and it's good for riders to learn how to function outside of a perfectly manicured environment. 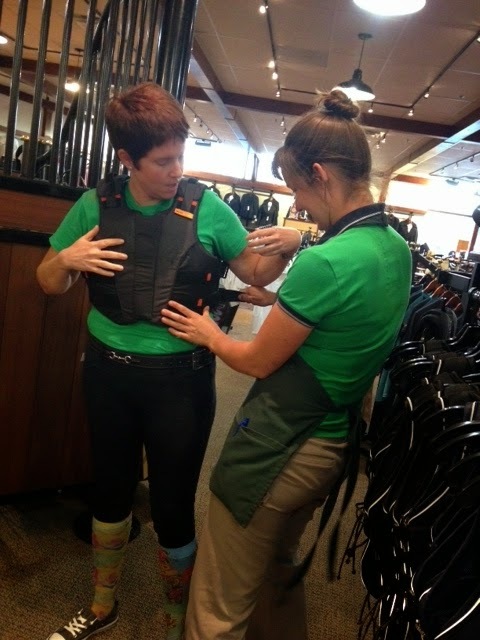 Getting fitted for a vest by Sarah Jane at my local Dover Saddlery. Do they come with a "No Muffin Top" option? As the appointed day got closer, I began to over-analyze things. What the hell was I thinking? I'm 44 and the Sainted Mare is 18. Were we the proverbial dogs trying to learn new tricks? I can barely find a distance in the aforementioned manicured ring over featherweight poles - what in God's name made me think I could do so over varied terrain with solid obstacles?? I have a crisis of confidence each time I approach an oxer, what would I do when faced with a Trakehner? Then (and this was the height of stupidity) for some reason I decided to watch the footage of the 1976 Montreal Olympic eventing competition at Bromont. I watched that with one eye closed, wincing and cringing and occasionally gasping loudly as one by one horse and rider teams came to grief at various obstacles. However, despite serious misgivings and fears of grievous bodily harm when the day came I found myself loading Sugar on my friend Mary-Ann's trailer and heading over to the farm we were schooling at. This farm was seriously gorgeous, to the point that when we turned down the drive both our jaws fell open in shocked appreciation (Jealousy? Lust?) I mean, the barn was bigger than my house. Hell, the tack room was bigger than my house. Sug came off the trailer and looked around with interest. Once she'd done a quick perusal and noted that everything met her standards, she pricked her ears and studied the field with the cross country course, almost as if she was trying to figure what wild hair Mom had gone and grown now. Let me tell you, the Sainted Mare was jazzed to be out in that field. Her head was up, her ears were up, and she moved out in the brilliant floating trot she gets when she's having fun and feeling good. we trotted around, getting a good gander at the fences, and then picked up the canter to do a large loop around the field. Her Majesty was feeling sassy, shaking her head a bit and threatening to throw in a happy buck or two. We started jumping over a little vertical, then going down a small incline then galloping down to a log, turning around and galloping back up the incline to pop over an oxer. Okay, sounds easy, but if you're used to going on flat, perfectly manicured footing, well then, galloping on grass and going up and down hills is a whole 'nother thing altogether! Then we went up the oxer, down the vertical and the log, then around and up another hill to jump another log that set right up on the lip of the hill. Again, you don't see a lot of this stuff in show jumping (unless of you spend lots of time in Spruce Meadows or Hamburg) so I was operating on a wing and a prayer. Sug, bless her heart, thought this was all great fun and figured things out despite whatever I was doing on her back. We went up and down hills, and jumped things going both and down. We jumped logs, both singly and in stacks. We slalomed in and out of trees as we navigated through the courses we were given. 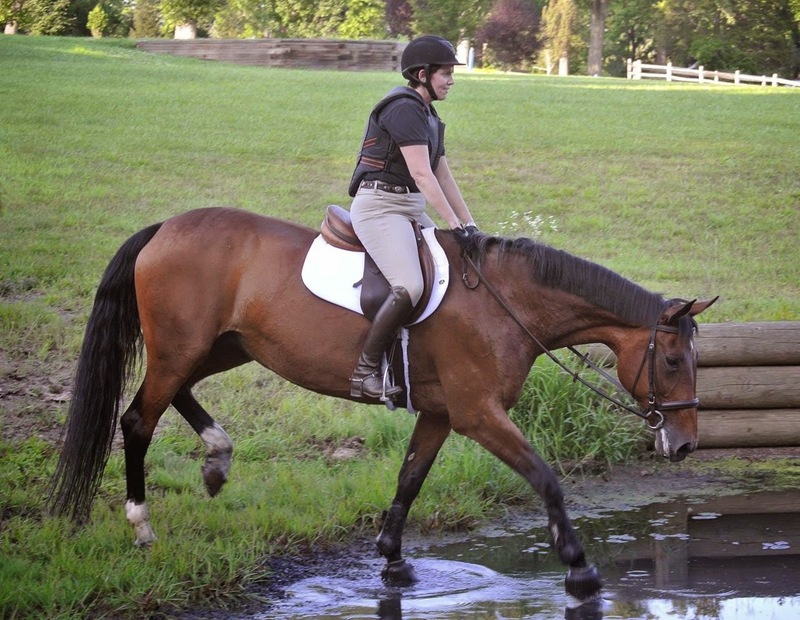 We even jumped a ditch, which went a heck of a lot better than I thought it would. The ditch came in the middle of the course and I'd wanted to jump it by itself first. "Nope, you can do it, " said Virginia as she told me to sit back and slip the reins. At least, I think she said that - she told me to lean back and slip the reins a few times. That's another thing -- she kept telling me to go with a longer rein, which went totally against my jumper training. Virginia said if I didn't I might end up on Sug's neck or falling out the front door if she pecked or needed to put her head down to balance herself, so out of the sheer will to live I figured I'd listen to Virginia. The most entertaining part of the afternoon came when we got to the water obstacle. If you've been following AWIP at all, you might recall that the Sainted Mare is highly aquaphobic. She's been known to go wheels-up if there's a puddle in the wash stall, so I was anticipating a discussion at the water. Sug didn't disappoint. She refused to get within 10 feet of it at first, wheeling and backing and hopping up and down. We tried for about 5 minutes to convince her to get close, but she wasn't having it. This was taken after we had a 20 minute discussion. Mary-Ann and her horse Bene then tried to give us a lead. We tried this from a standstill near the water, then following at a trot and then approaching the water. Nothing doing. Just when we were about to call it a day and watch while Mary-Ann and Bene schooled the water, Sug decided she'd better go ahead and humor us and leapt into the middle of the water, gathered herself, and leapt out of it. There was much fussing and patting and we then went back and forth through the water until we could do it without any fussing. Then we tried jumping a stack of logs, followed by a slight back and then down through the water and then up a small hill to a log. The first time we attempted it Sug saw the water on the other side of the logs and said, "Oh, HELL no!" I circled her, sat in the back seat and rode defensively as I was told, and we went up, over, throughout the water and up over the log like we did it every day. So that was it. Our big foray over to the eventing side of the equestrian world. I'm so glad I tried it. Screwing up my courage and jumping cross country obstacles made me feel all kinds of badass, which will hopefully make me more confident in my show jumping. Plus, learning how to ride and jump over varied terrain is really good for you- I felt super solid in the tack the next time I popped over some fences in our ring. Who knows - this may be the start of something special. Loved reading this! Looks like y'all had a blast. How fun!! She looks adorable out there! Awwww I love Sugs! You guys are a great team. Thanks, Sprinkler! I do too. :) God love, she sure does have a sense of humor, and is very welling to put up with whatever nonsense I throw at her. Good work! I love XC schooling jumping horses (except the really neurotic ones). I think it makes the horse smarter and more confident.